This was a bit of a Waste Not Want Not recipe for me – a Tuesday evening and a fridge full of leftovers from the weekend. What to do with a cold baked potato, some roasted veg and half a punnet of mushrooms? 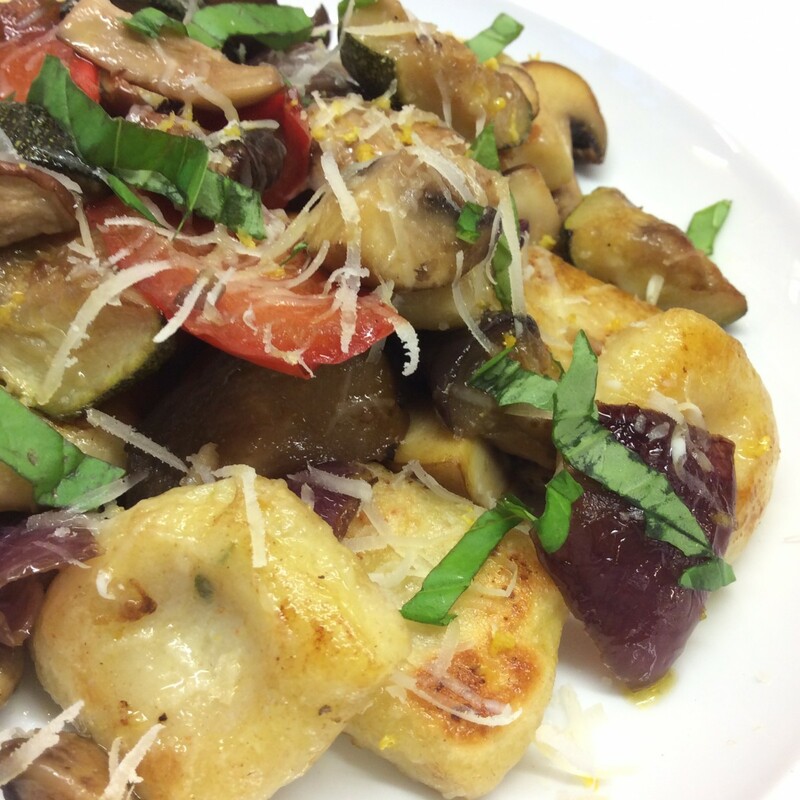 Gnocchi is the answer. Gorgeous little Italian dumplings flavoured with thyme and served with the vegetables and a good grating of parmesan cheese. The gnocchi are from a Gordon Ramsey recipe that I halved, so it is easily doubled to serve 4. Scoop the flesh from the baked potato and mash until smooth (best done whilst the potato is hot to prevent lumps). Add the cheese, flour and a spoonful of thyme leaves, and season slightly. Make a well in the centre and add the beaten egg. Combine with floured hands until a soft dough forms. Do not overwork or the dough will become too tough. Roll the dough out into a long cylinder about 1 1/2 cm thick, on a well floured surface and cut into 2cm wide pieces. Gently press the centre of each one to create a dent. Bring a large saucepan of water to the boil. Add the gnocchi a few at a time, stirring gently to prevent them from sticking together. Simmer for 2 minutes until they start to float to the surface. Carefully remove from the pan and allow to dry on a sheet of greaseproof paper until needed. Heat a large frying pan over a medium heat and add a tablespoon of oil. Fry the mushrooms until their juices are released, then add the roasted vegetables and heat through. Remove to a warm plate. Add another tablespoon of oil and add the gnocchi. Cook for approximately 2 minutes on each side, or until golden brown. Add a very large knob of butter to the pan and allow to melt. Stir through the mushrooms, roasted vegetables and peas, and grate over some lemon zest. Serve with grated Parmesan and a sprinkling of chopped basil if you have any.